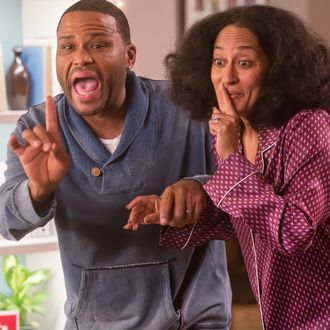 In the grand tradition of sitcoms slyly getting you hyped for an unexpected spin-off, Black-ish is reportedly filming a flashback episode about a young Rainbow, played in adulthood by Golden Globe winner Tracee Ellis Ross, next month. According to Deadline, the throwback ep is allegedly intended to whet your appetite for a spin-off already in early development at ABC. In the spirit of the show’s other spin-off Grown-ish, which tracks Yara Shahidi’s Zoey as she matures out of the Johnson household and goes off to college, the as-yet unnamed prequel will reportedly focus on Rainbow’s teenage years in the ‘90s. (According to TVLine, the series is going even farther back, to a preteen Bow in the ‘80s.) While Black-ish creator Kenya Barris reportedly might executive produce his show’s young Bow spin-off, his departure for Netflix means ABC will eventually go on to experience the full double Rainbow without him.